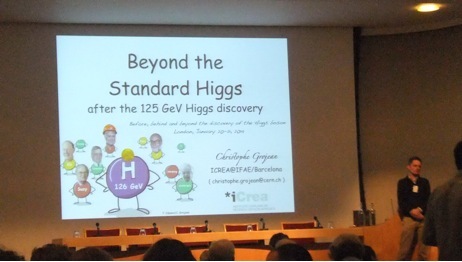 Today we have a post by Vladimir Yershov, who attended a Royal Society discussion meeting on the Higgs Boson recently. Here he shares his thoughts and observations on the exciting discovery and its possible implications. 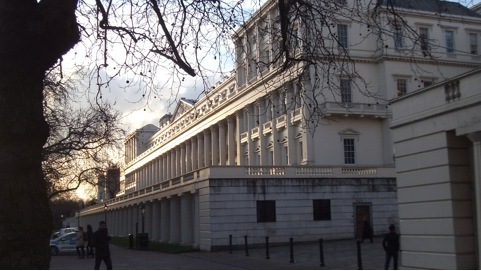 On the 20th and 21st of January 2014 I attended a discussion meeting organised in London by the Royal Society. The meeting was called “Before, behind and beyond the discovery of the Higgs boson” and was intended to discuss the results obtained by CERN in 2012/2013. The 2013 Nobel Prize was awarded to Peter Higgs and François Englert upon the detection of the Higgs boson and the results presented at this meeting were to discuss this result and its legacy. Unfortunately, Peter Higgs was not able to attend the Royal Society meeting due to illness. Instead, a video recording of his quite short Nobel prize talk was shown to the participants. Overall, I found this meeting interesting because the CERN results were presented by the leaders of the project so you could have the information first hand. Here are my subjective impressions about this conference. First of all, there is no doubt that a new particle has been discovered. Such a thing has not happened for many years (the last particle previously discovered was the top quark in 1995). By analysing a lot of background noise events, CERN physicists were able to unveil an excess of events at the energy of about 125 GeV, which corresponds to the mass of the new particle. In 2012, it was reported that a new particle had been detected at the 6-sigma confidence level (editor: better than a 99.999999% chance of being a real detection) on both instruments involved (called ATLAS and CMS). A year later, in 2013, the same teams calculated the spin of the particle by analysing the scattering angles for the events corresponding to the decay of the new particle. The spin was found to be zero, which matched the spin predicted for the Higgs boson. Since all of the properties of the new particle matched those predicted for the Higgs boson, it was then possible for the Nobel Committee to decide that the 2013 award should be given to Peter Higgs and François Englert. My impression from the talks was that the physicists were trying to convince public that the newly discovered particle cannot be anything but the Higgs boson, although the presenters admitted that we cannot be 100% sure. For example, Fabiola Gianotti, the co-ordinator of the ATLAS experiment, in her talk first stated that we are now absolutely sure that we have discovered the Higgs boson, but at the end of her talk she said that the probability of this particle being the Standard Model Higgs boson is only about 20%. The team leader of the CMS experiment, Professor Tejinder Virdee, highlighted that the Higgs boson field does not explain particles masses, but rather it accommodates them into the Standard Model of particle physics. The main distinction of the Higgs boson particle from the rest of the elementary particles is that the interaction between Higgs and any other given Standard Model particle is proportional to the particle mass. In my view, this is confusing because we have here circular reasoning: (1) the mass of a particle is determined by its interaction with the Higgs field and (2) the strength of the interaction of the Higgs field with any particle is proportional to the mass of that particle. This reminds me the famous story of Baron Münchhausen pulling himself out of a swamp by his own hair. There was an interesting talk by Prof. Chris Grojean (Photo 3) who demonstrated that there exist a lot of possibilities that the new particles might be something else rather than the Higgs. An elementary, weakly coupled and solitary Higgs boson allows to us to extend the validity of the Standard Model up to very high energy. Nonetheless, this scenario fails to fill the universe with Dark Matter and does not explain the matter-antimatter asymmetry. Amending the Standard Model tends to destabilise the weak scale by large quantum corrections to the Higgs potential. New degrees of freedom, new forces, new organising principles are needed to solve these problems. Therefore, it is possible that the Higgs particle is not a new elementary particle, but a resonance or a bound state of existing Standard Model particles. Verifying this (or not) will require a lot of work. The final proof for the new particle to be the Higgs boson should be based on the measuring the properties, which uniquely distinguish Higgs from resonances or possible bound states. These properties are the proportionality of the strength of the Higgs interaction to the masses of the particles involved in the interaction. Demonstrating this will take many years of research. 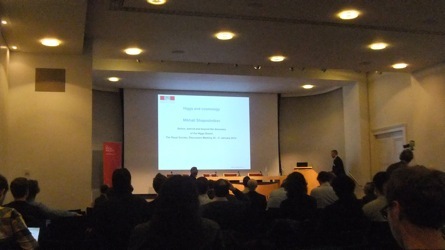 Prof. Christophe Grojean presents the alternative possibilities for the nature of the Higgs particle. At the end of the conference, Prof. Mikhail Shaposhnikov presented a talk explaining all of the remaining mysteries of the Universe. According to him, the Higgs fields of the Standard Model can make the Universe flat, homogeneous and isotropic. In addition, it can produce quantum fluctuations, the seeds for structure formation, which heat the Universe resulting in the Hot Big Bang. If the Higgs field exists, it must be coupled to gravity (that is, to gravitons). The potential of the Higgs field resembles that of the fields proposed to be leading to inflation. The theory is that initially the vacuum slowly “rolls down” the potential well of the field, but near the origin the potential has a tiny bump that makes the field oscillate, thereby re-heating the universe up to an energy of about 1013 GeV. This leads to the Hot Big Bang, and the Universe began to cool down. During this cooling all of the currently observed particles are born from the Higgs field. What observable does such a theory predict? The Standard Model contains only left-handed neutrinos, whereas the rest of the particles can be found in both left- and right-handed forms. Mikhail Shaposhnikov suggests that there should be right handed neutrinos (denoted N) whose mass is very high, but that do not interact with the other matter because the strength of their interaction is 10 orders of magnitude weaker than the strength of the normal weak interaction. These right-handed neutrinos are identified as Dark Matter. So in one theory most of the problems in physics could be solved… However at this moment, I thought that these theories didn’t really have anything to do with the observable properties of the Higgs particle itself, so I left the conference. 1) A new particle with mass 125 Gev and zero spin was discovered. If I was to make a bet I would guess that it is a bound state of an existing particle (for example of W+ and W– particles of opposite spins, which is similar to the positronium bound state of oppositely charged electrons)… but only more observations, hard work, and time, will tell what exactly it is that has been discovered in the underground tunnels of CERN!